Learn about the temperament and personality of the Polish Lowland Sheepdog. Discover what he's like to live with, his traits and characteristics and how he generally behaves. And look at lots of Polish Lowland Sheepdog photos. The Polish Lowland Sheepdog, or "PON" for short, is lively, watchful, intelligent, confident, and fearless. He works as a herding dog and a watchdog, and also makes a great companion for the right family. A PON has a strong temperament and individuality. He was born to guard and he does it well, patrolling his territory with earnest. He is an independent thinker and can be stubborn. He needs an assertive owner and consistent training from an early age, or he will dominate his master. If they trust and respect their owner, PONs are easier to train. They are usually easy to housetrain. A PON needs an active lifestyle. He loves to spend time outdoors. He thrives with one or two good walks each day, and loves to have a job to do, such as agility work. If a PON gets bored, or doesn't get enough exercise, he will destroy your house and your flower garden. He is loyal, affectionate, and loving toward his family. He thrives on having close contact with people. He is gentle with children if socialized around them at an early age, although he might try to herd them. He also does well with other animals, especially if socialized. He is often suspicious of strangers. He is a professional barker and will alert you if anything unusual is going on. All in all, the PON is perceptive, curious, sincere, happy, and very adaptable. They are spirited yet stable, and they mature quickly. They are smart and have excellent memories. The Polish Lowland Sheepdog is moderately easy to train. He learns new commands at the average rate. He is neither difficult nor easy to train. 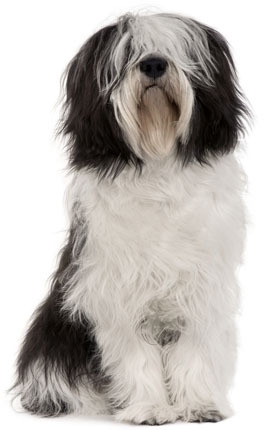 The Polish Lowland Sheepdog sheds a fair amount of hair. You'll find hair stuck to your couch, carpets, clothes and everything else in your home.